Krabi (Thailand) – February 24, 2017 (travelindex) – The ShellSea, a five-star resort located on a white-sand beach adjacent to Krabi’s famous Shell Fossil Beach is scheduled to soft open in April 2017. The beachfront resort offers 72 spacious guestrooms 12 luxurious villas and one grand villa, with 180-degree views of the Andaman Sea and facilities that include a lap pool, family pool, spa, restaurants, beachside bar, and a selection of non-motorised recreational water sport equipment. A motivated workout can be had at the state-of-the-art fitness centre, with wall-to-ceiling glass windows overlooking the panoramic views of the ocean. Reservations are now being accepted for bookings, with a starting rate of THB 5,000 for a ShellSea Garden room, subject to an additional 18.70 percent for service charge and government tax. The rate includes breakfast for two, Wi-Fi internet connection, and complimentary shuttle bus to Aonang Beach twice daily on a fixed time schedule. The ShellSea is owned and managed by Aonang Ville Co Ltd, which also owns and operates Aonang Villa Resort, one of the longest established resorts at Krabi’s Aonang Beach. 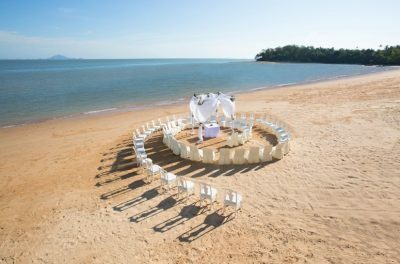 The resort is set directly on a 300-metre white-sand beach that links directly with the famous shell fossil plate, thereby offering guests classic beachfront resort relaxation along with the opportunity to explore one of Krabi’s prime attractions. Guestrooms include Sea View rooms and Beach Front rooms, each with their own private balcony; Beach Front Pool Access rooms, on the ground floor; Sea Villas, each with their own pool and private terrace; and a Grand Villa, with its own pool and a full 180-degree view of the ocean from its beachfront setting.